(AP) PUNXSUTAWNEY, Pa. - Pennsylvania's Punxsutawney Phil emerged from his lair to "see" his shadow on Thursday, in the process predicting six more weeks of winter. The groundhog made his "prediction" on Gobbler's Knob, a tiny hill in the town for which he's named about 65 miles northeast of Pittsburgh. Temperatures were near freezing when he emerged at dawn — unseasonably warm — and were forecast to climb into the mid-40s in a winter that's brought little snow and only a few notably cold days to much of the East. Thursday's ceremony is largely that: Phil's prediction is determined ahead of time by the Inner Circle, a group who dons top hats and tuxedos and decides in advance what the groundhog will predict. Organizers expected 15,000 to 18,000 people to witness the furry creature's prognostication ceremony just before 7:30 a.m. EST. This year's crowd was warmer than most. The average early-morning temperature usually hovers around 17 degrees, according to the National Weather Service. Pennsylvania Gov. Tom Corbett was among the spectators this year. Those who couldn't make it to Gobbler's Knob could follow the groundhog on Twitter and Facebook, or watch a webcast of the event on his website. 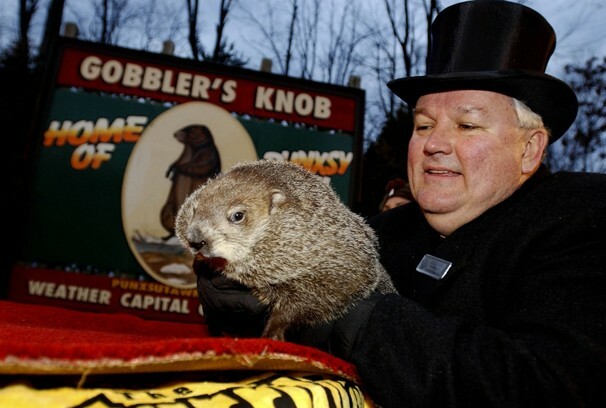 "What started as a small gathering in 1887 has now evolved into tens of thousands of visitors from around the nation and even the world coming to Punxsutawney to participate in this time-honored Groundhog Day tradition," Corbett said. Phil has now seen his shadow 100 times and hasn't seen it just 16 times since 1886, according to the Punxsutawney Groundhog Club's Inner Circle, which runs the event. There are no records for the remaining years. The tradition attained a large following with the 1993 Bill Murray comedy "Groundhog Day," in which a weatherman covering the event must relive the day over and over again. Before the movie came out, Phil was lucky to have an audience of 2,500, said Mike Johnston, vice president of the Inner Circle. And while the group has records of Phil's predictions dating back to 1886, what it doesn't have is a tally of whether Phil was right. Johnston said the reason is simple: "He's never been wrong." Phil is "incapable of error," he said, because the groundhog smartly avoids being site-specific in his prognostications. If Phil predicts six more weeks of winter, said Johnston, "I guarantee you someone's going to have six more weeks of winter." Wrentham, MA Northeast Financial Strategies Inc.